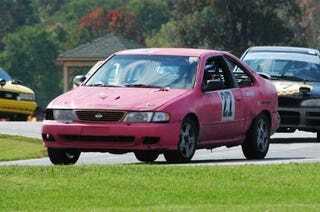 For The First Time In 24 Hours Of LeMons History... Nissan Victory! OK, Nissan fans, you can stop agonizing over the so-called Curse Of Nissan at the 24 Hours Of LeMons, because one of your cars has finally taken the overall win! That's right, a Nissan took the checkered flag at the Lamest Day. It wasn't any Z car or even an SE-R. No, the winner- a car with a quickest lap a full seven seconds slower than the best lap of the race- was a Sentra-based, front-wheel-drive 1996 Nissan 200SX. While most other Lamest Day contestants racked up between four and seven black flags apiece over the course of the weekend, the Booby Prize Racing 200SX avoided the dreaded Penalty Box entirely; while other, faster cars were spitting rods through the hood or getting the Cone Of Shame bolted to the roof, the Booby Prize car was grinding out lap after lap after drama-free lap... which is how you win an endurance race. Good job, Booby Prize Racing!